Hyper assist its user to create a real clients database. The system checks every new lead and client and verifies that no duplicate card is already exist in the system, by checking the phone number and the Email address. 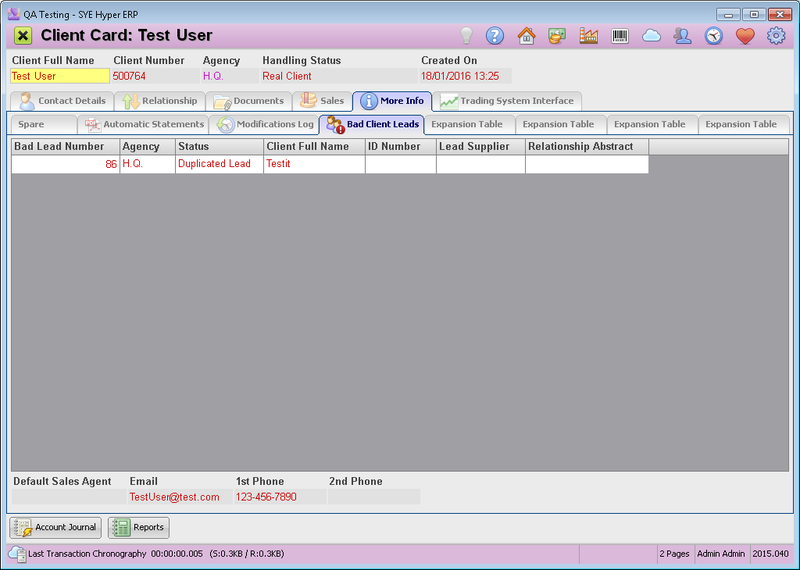 This table displays all of the duplicate leads of this client that have been received or created. To view the entire list of duplicate leads, go to the "Bad Client Leads" tab of the "Reports & Lists" tab in the main page of Hyper. Bad clients are clients or leads that have been received, even though they have missing details or contact details which are similar to other existing client card details. Additional information can be displayed in the information fields at the bottom of this page, according tho the users needs. The amount of leads that were disqualified or rejected during the marketing process or during the first contact with the client. Conversion rate - checking the amount of leads that have not been converted from external systems into the Client table. The bad leads are saved in the duplicate leads data base (Bad Client Leads), as described at the bottom of this page. Recovering and deleting leads are available from the Bad Client Leads table in the "Reports & Lists" tab.